Looking for marketing guidance for your freelance or consulting business? Anna Laman is a messaging advisor for independent businesses. The idea of overhauling your website content is totally overwhelming, right? I get that. It feels like you need to set aside a whole week, brush up on your Strunk & White, and somehow transform into Don Draper (#daydrinking). But it really doesn’t have to be that complicated. Yes, a total overhaul takes quite a bit of work, along with a heavy dash of soul searching — but there are lots of smaller improvements you can make to your website content that will drastically increase its effectiveness. Here are three simple things you can start with today, and each one will only take you a few minutes. 1. Add a description of your business to your home page. Duh, right? Wrong! You would be amazed at how many websites out there neglect to include the most basic information on their prime real estate. I’ve stumbled onto so many sites where I have to click through several pages just to piece together what exactly the business DOES. Ugh! Go to your home page right now. If it doesn’t announce, loud and clear, up front and above the fold who you are, what service you provide and for whom, then get in there and add it right now! 2. Put a “call to action” on every page. I’m assuming that since you’re running a business, your ultimate goal is to make money. So I’m also assuming that if someone visits your website, you don’t just want them to admire your trendy font choices — you want them to take an action. If that’s true, you need to guide them to what that action is. On every page of your website, you should be suggesting the next step for them to take. It could be as simple as plopping a “contact me” button at the bottom of every page. Or maybe you want them to download your free guide, fill out a survey, subscribe to your mailing list, or make a purchase. Whatever it is, you’ve gotta make the ask! 3. Get rid of jargon and buzzwords. But I just have to tell you… when you put those words on your website, NO ONE KNOWS WHAT THE HELL YOU’RE TALKING ABOUT. And if they don’t know what you’re talking about, they are very unlikely to give you money! So please, for the love of all that is holy, go through your website content right now and remove any instance of the following words: solution, value, innovative, strategic, and leverage. Take them outside and burn them, and please promise you will never use them again. They are vague, meaningless drivel and they’re not helping anyone. Next, go through and find any acronyms, jargon, or buzzwords that your Uncle Larry wouldn’t understand. Then put them back in your brain where they belong (or in that business-related Facebook group you’re a member of) and translate them into normal English and put that on your website instead. Hooray! Now you have a website for humans. Hey, have you noticed that all of those tips have something in common? One way to describe the overall gist is: say what you mean. Use plain, direct language. Tell your website visitors what you do, how you do it, and what you want them to do next. We can all get so caught up in making our writing sound “professional,” that we actually forget to include the simple things that make a website more readable and effective. So if you simply do that, you’ll be well on your way to having a website that makes more sense than 80%* of all websites out there. P.S. If you’re ready for more, give me a shout and we can do a big, fat overhaul of all of your website content, together. *This is a ballpark estimate based on my completely made-up research. Oct 4, 2018 "Can you just tweak my website copy?" Jul 11, 2017 Stop Reading Your Competitors' Websites! May 29, 2014 Have You Checked Your Blind Spots? Mar 27, 2014 Who Have You Learned From Lately? Are you making these 12 mistakes on your website? 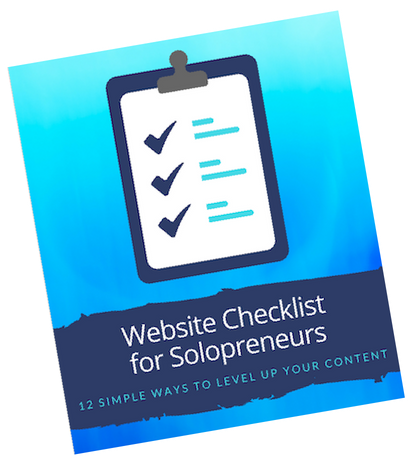 Subscribe to my email list to get immediate access to my Website Checklist for Solopreneurs – and make sure your prospective clients understand what the heck you're talking about! © 2018 Anna Laman. All Rights Reserved.